Mahoora Tented Safari Camps, acclaimed pioneers of delivering legendary hospitality in rustic settings scooped the coveted ‘Best Small Accommodation Provider’ at the recent Sri Lanka Tourism Awards 2018. The gala event held at the Shangri-La, Colombo was celebrated amongst a host of distinguished attendees including members from the tourism industry. 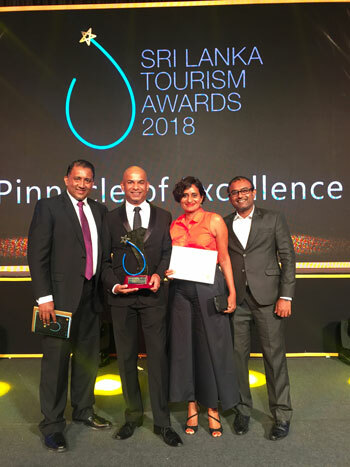 Organised by the Sri Lanka Tourism Development Authority, the Sri Lanka Tourism Awards 2018 recognised exceptional local service providers who played a pivotal role in the industry, for their commitment in creating exceptional guest experiences and attracting record numbers of foreign travellers. The winners also fulfilled prerequisite criteria including contributing significantly towards service excellence in the tourism industry. Through Mahoora’s dedication to environmentally conscious hospitality and sustainable conservation it has achieved many firsts such as the only Tented Safari Camp to obtain partnership from TRAVELIFE and the first Tented Safari Camp in the world to go carbon neutral. “As we continue to set the bar high in private tented safari camps, this has also enabled Sri Lanka to compete in the global wildlife tourism arena,” Bandara added. As Mahoora continues to lead the way in its innovative approach to sustainable tourism and conservation, the company also continues to empower local communities. “By providing employment at grass root level, we develop employees and enhance their skills. This also contributes towards building their livelihoods and also those of their families. It has been extremely satisfying to watch our people and their families grow,” noted Bandara. Eco Team’s Mahoora Tented Safari Camps and Explorer by Mahoora Camps, built with the utmost respect for the environment aspiring to leave behind nothing but footprints, proudly announce a unique conservation milestone as the country’s first ever tented safari camps to be renewing it’s certification as carbon neutral . Guests at Mahoora Tented Safari camps in Yala, Wilpattu and Udawalave together with Explorer by Mahoora located in less frequented parks such as Gal Oya, Kumana, Bundala, Maduru Oya, Dambana, Wasgamuwa, Knuckles, Minneriya are now able to enjoy the pristine wilderness with full knowledge that their travel carbon footprint has been fully offset. Establishing a new bar of environmental stewardship and sustainability Mahoora in addition to efforts to greatly reduce gas emissions from its operations, have also offset emissions through purchasing credits. The agreement to voluntarily fund carbon neutrality from internal revenues was concluded recently. Based on the agreement, Eco Team (Pvt) Ltd purchased 25 tonnes of Carbon Credits on behalf of Mahoora, from Carbon Credit Capital (CCC) LLC, a global specialised carbon offset management entity linking international and local partners to high-quality carbon emission reduction projects. The newly purchased credits are generated by the ‘Wind Power’ Project at Jai Bhim by Serum Institute of India Limited, India. The purchased credits will be used from November 2018 onwards. 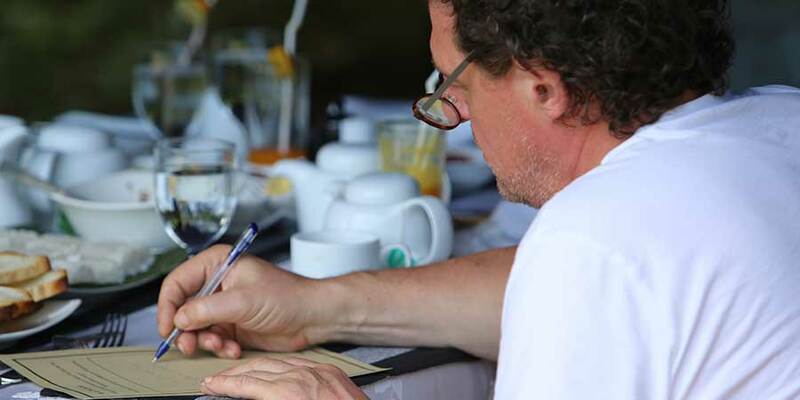 Guests who stay at Mahoora Camps will be presented a souvenir crafted from recycled paper with a certificate mentioning their holiday has been totally environmentally friendly and carbon neutral. Offsetting carbon dioxide emissions is the reduction greenhouse gases in order to compensate for an emission made elsewhere. In simple terms, offsetting one tonne of carbon means will be one tonne less in the atmosphere than would otherwise have been released. It is accepted as the fastest way to achieve emission reductions and the only way to achieve carbon neutrality. As a pioneering eco-tourism company in Sri Lanka, which firmly believes in ‘walking the talk’ Mahoora camps since 2010 have taken continuous incremental steps to reduce the emissions from its activities. These include becoming Sri Lanka's first Carbon Neutral Luxury Camp in 2010. In addition, championing ‘Go Green & Sustainable’ through its operations Mahoora Camps use Effective Microorganism Technology (EMT) to manage waste at campsites, have made all sites a plastic free zone, use solar power to generate electricity, reduced the use of artificial lights to minimize light pollution and work closely with local communities in providing indirect benefits through its operations. As pioneers in achieving carbon neutrality, Mahoora Camps understand the importance of sustainable tourism. Having embraced this important ethos, the camps encourages every traveler in become a responsible tourist, who in turn are inspired by these efforts knowing their stay results in zero impact to the environment in terms of emissions. Safaris are life-changing experiences interspersed with the delight of discovery. Providing guests an unsurpassed Sri Lankan wildlife experience, delivering legendary hospitality in rustic yet sophisticated interiors, the pioneer of private tented safari camps, Mahoora’ celebrated two decades of curated life-changing journeys recently. Mahoora’ part of eco-sensitive and leading adventure tourism company, Eco Team, ensures travellers experience unique encounters, and a safari rich with Sri Lankan wildlife and culture. From humble beginnings of a make-shift/mobile camping concept operating inside the main national parks and nature reserves in Sri Lanka, Mahoora has strived towards a single overriding purpose; to conserve and preserve Sri Lanka’s wilderness and wildlife by creating life-changing journeys and inspiring positive action. “This 20th year marks a special milestone for us as we celebrate the reputation of our camps, our extraordinary staff, and strong relationships with guests and travel partners. We aim to continue to offer unique accommodation for travellers to enjoy some of Sri Lanka’s most incredible landscapes and environments in the knowledge that their stay also supports local communities and protects our ecological heritage,” said Anuruddha Bandara, Founder/CEO, Eco Team (Pvt) Ltd.
As a game changer, Mahoora’s unique new private tented camps ‘Explorer by Mahoora’ offers a more intimate and unadulterated perspective in less frequented national parks. Covering many habitats, the camps encompass incredibly diverse and all-round experiences operating in Gal Oya, Kumana, Minneriya, Wasgamuwa, Knuckles, Sinharaja and Bundala National parks with future plans to expand into the country’s three larger national parks; Yala, Udawalawe and Wilpattu. Through ‘Explorer by Mahoora’ guests can rediscover a private and exclusive safari setting, where the peaceful essence of the park can be truly experienced. Five to six guests enjoy unrivalled closeness to the surroundings with only a canvass separating them in rediscovering nature. Guests very often witness the trumpeting of elephants, a sloth bear nonchalantly walking by, a roar of a leopard, all in close vicinity offering travelers true wilderness living. The camps truly embody a sense of natural luxury and elegance - each with its own style and character harmoniously blending into the magnificent surroundings. Personal staff, ensuite bathrooms, running water, showers, fans, single beds, linen etc., provides a fully serviced camping experience that is comfortable yet remains rustic; a truly memorable experience where guests experience true wilderness amidst unique natural settings. Each Mahoora camp is unique and distinctive as the environment that surrounds them. The beautiful interiors feature earthy tones that echo the magnificent natural setting, while a sophisticated safari style offers a contemporary spin on the traditional tented camp. With the aim of creating immersive and meaningful experiences, Mahoora introduces guests to every aspect of private tented safari camping; from relaxing in camp, dining in the bush to observing nature unfold or even getting to know staff, their heritage and culture. Mahoora stays true to the belief that its service offering must be a true example of effectively balancing ecological needs linking responsible tourism with conservation and the community. Using technology and innovation in order to minimise both the carbon and physical footprint and being cost effective ensuring meaningful and lasting benefits to its natural environments is fitting ethos for Mahoora as it continues to create exceptional journeys that are truly sustainable. Inspired by Eco Team’s philosophy as an authentic and sustainable ecotourism company, Mahoora aims to continue to provide each guest real experiences, positively impacting the ongoing biodiversity of the country’s wilderness heritage and the empowerment of its people. Today, providing private tented safari camps, through Mahoora and ‘Explorer by Mahoora’ the company aims to offer guests an authentic tailor-made safari experience, warm local hospitality and sublime natural luxury. Sri Lanka’s very own Mahoora Tented Safari Camps in Yala made it into a list of the world’s top 10 most romantic safari lodges recently, marking yet another memorable milestone. Mahoora was picked by Huffington Post, a premier global online news site, in an article featuring the 10 most romantic safari lodges in the world. The listing highlights Mahoora’s excellence and reaffirms its commitment to providing truly unforgettable experiences to discerning travellers. The top picks included widely-popular safari lodges in Africa and one in India, making the Lankan operation’s achievement all the more noteworthy. While this accolade is indeed a highpoint for Mahoora, it’s not really surprising that it was included in the top 10 list, given that Mahoora has a proven track record of offering guests a truly outstanding experience every single time. The luxury tented safari camp operation of Eco Team (Pvt.) Ltd., is the pioneer provider of tented safari camping in Sri Lanka and has perfected its offering over the years. A Mahoora camping experience is unlike any other wildlife experience available in Sri Lanka, as it takes you to right into the heart of nature without sacrificing on luxury. Its luxury tented accommodation is akin to that of a star-class hotel and comprises hot water, fully-functional toilets, toiletries, luxurious bedding, and a range of other amenities that go hand-in-hand with a Mahoora experience. Reaffirming its commitment to the environment and in line with eco-friendly and sustainable practices, the tents themselves are fabricated in Sri Lanka using locally-sourced environmentally-friendly material of the highest standards. In fact, Mahoora also takes pride in being the world’s first carbon neutral mobile tented safari camp company and has taken steps to offset its comparably low operational footprint for the betterment of the environment. 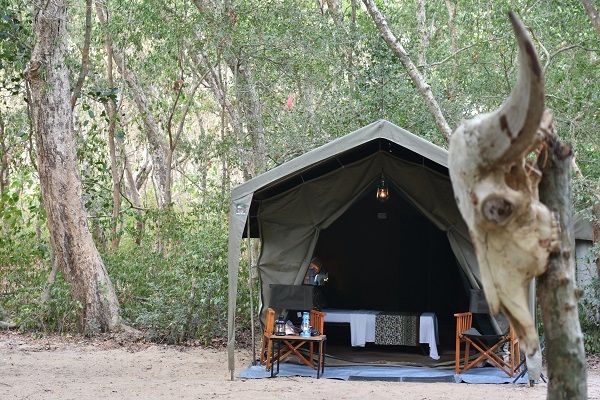 Yala National Park is the most popular mobile tented camping destination the operator offers, owing to the park’s high concentration of wild Sri Lankan leopards. It also operates luxury camps in 11 other locations throughout Sri Lanka, taking into account the diverse wildlife experiences that this island has to offer. Mahoora Elite Tented Camps operate in prime wildlife locations such as Wilpattu, Udawalawe, Minneriya, Sinharaja, Kumana, and Bundala. Experienced naturalist guides are part of every wildlife safari tour, making each experience all the more memorable, and Mahoora promises – and delivers – an unmatched experience in every instance, be it a jeep safari in Yala or a walking safari in Knuckles. Commenting on Mahoora’s inclusion in Huffington Post UK’s listing in its lifestyle section, Eco Team (Pvt.) Ltd. CEO Anuruddha Bandara attributed it to the hard work and dedication of his team. “We are truly delighted to be recognised once again as one of the world’s best in what we do. We consider this a reward for our commitment to delivering high-quality experiential safari products suitable for niche groups. We specialise in providing a private high-end romantic atmosphere in the midst of the wilderness for couples on their honeymoon and others. I am grateful to my hardworking team that Mahoora was recognised by Huffington Post UK,” he added. Each Mahoora experience is as unique and as exciting as the next, especially given Sri Lanka’s varied and impressive wildlife offering, which never fails to amaze, ranging from majestic leopards to the truly impressive list of birds that call the island home. Mahoora is well-equipped to provide private accommodation on request, providing honeymooners an amazing overall experience – be it a romantic lantern-lit dinner for two on the banks of a river, or having meals served in the privacy and intimacy of the tent.